If you take a look at both the soccer cleats and baseball cleats, you’ll find that both the cleats are very much similar. So, if you play both soccer and baseball, then a few questions definitely come to your mind. In this article, I’ll try to provide the best answer to you so that there will be no confusion in your mind. Along with that, we will also compare baseball cleats vs. soccer cleats. Can I Wear Soccer Cleats for Baseball? Can I Wear Baseball Cleats for Soccer? Yes, you can wear soccer cleats in baseball little leagues and for fun games. But, if you are a serious player who wants to play baseball professionally, then you should not wear soccer cleats in a baseball game. 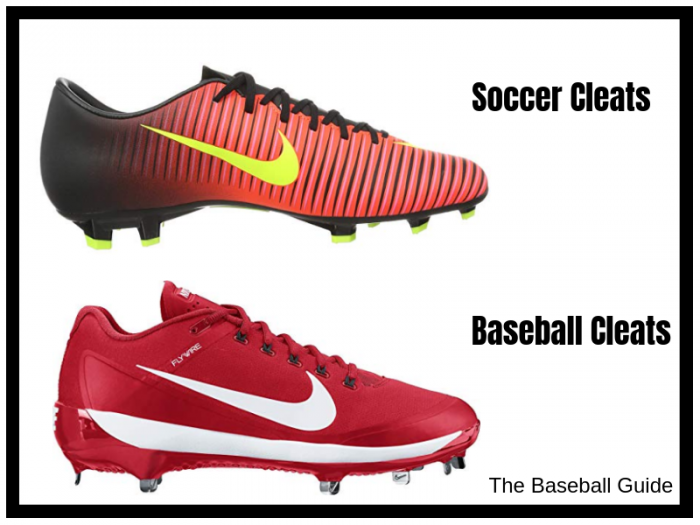 The soccer cleats and baseball cleats are very similar, but they are slightly different. This small difference may not be visible in a fun game, but in a competitive baseball game, this difference can affect your performance. Therefore, I recommend that you should not wear soccer cleats in your game. Instead, choose a pair from these best cleats for baseball in 2019. You can wear soccer cleats for baseball. But, you can’t wear baseball cleats for soccer. Because in the baseball cleats you’ll find an extra toe stud, and this can be dangerous during the soccer tackles. 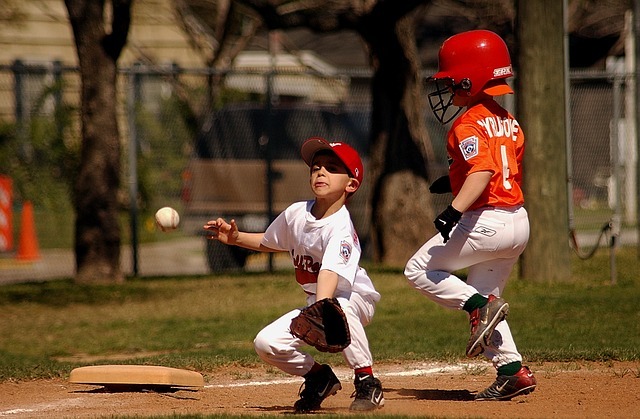 Therefore, in some youth soccer leagues, referees check the cleat pattern of the players before the game, and they don’t allow the players to play soccer wearing baseball cleats. Both the cleats are very similar to each other, but they’re different because they’re made for that specific sport. The soccer cleats are lightweight as compared to the baseball cleats. In soccer, players need to be very quick, and they also have to do a lot of footwork as compared to the baseball. Therefore, the soccer cleats are more lightweight & supple to help them in their game. If you take a look at the soccer cleats, you’ll notice that the front area is much more rounded. This is the strike zone of the cleats, therefore, this need to be more rounded so that soccer players can easily give the desired direction to the ball. While, in the baseball cleats, there is a rubber toe guard in the front area. The baseball players like pitchers and catchers put a lot of pressure on the front part, therefore, you’ll get a toe guard to add the durability of the cleats. Almost always, you will see that soccer players wear only low top soccer cleats. The mid top or high top cleats provide ankle support, but they also add extra weight to your feet. As, speed is most important in soccer, therefore, soccer cleats come in low cut. In baseball cleats, you can easily find low top, mid top, or high top cleats that provide sufficient ankle support to your feet. In baseball, players do not have to keep running all the time. But, they have to frequent running and sliding to catch the balls. In soccer cleats, there is very little to no midsole. Therefore, soccer cleats are not very comfortable to wear as compared to the baseball cleats. The baseball cleats have cushioned midsole that provide comfort to the feet. 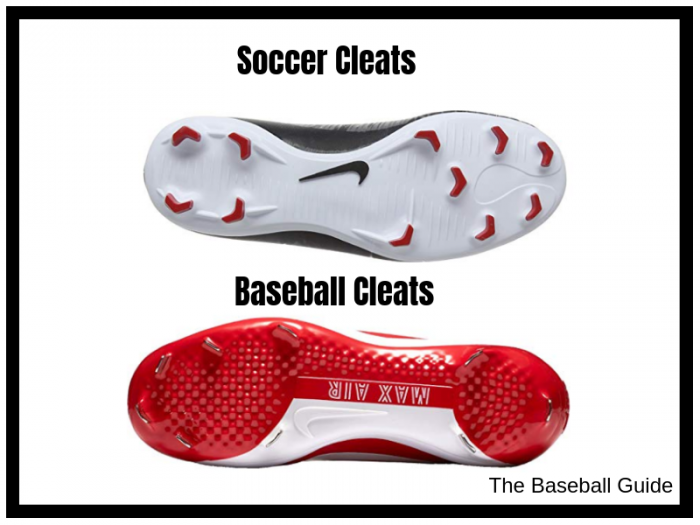 The biggest difference is the extra toe stud that you’ll find in the baseball cleats. This toe cleat allows the player to dig easily into the ground and take it off. 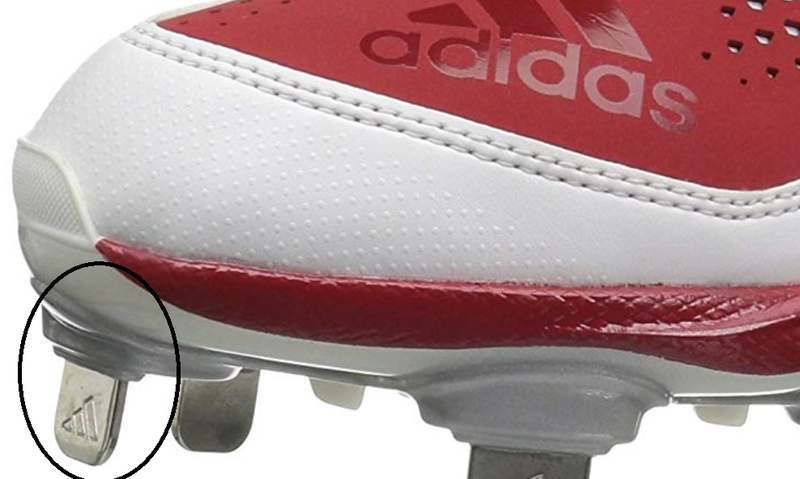 If you want to modify a baseball cleat to a soccer cleat, then you can cut off the front toe stud, and transform it. The baseball shoes come in different options. Like, there are three different type of shoes you can find. These include molded cleats, metal cleats, and the turf shoes depending upon the field. You can find more information about molded cleats in this article. While mostly you’ll find soccer cleats with rubber studs. When it comes to buying a pair of soccer cleats, then I personally like Adidas and Nike cleats. If I have to recommend you two pair of soccer cleats, then I’ll suggest you try Adidas Performance Copa Mundial Soccer Shoe and Nike Mercurial Soccer Cleats. Both of these cleats are lightweight that will help the soccer players to run as fast as possible. As soccer players need to run a lot on the field, therefore their cleats need to be durable, and both of these cleats are highly durable compared to the price you’ll pay for them. There will be some difference in the design and a few features, but overall quality of both of these cleats is simply awesome. But, you should not limit yourself only to these cleats. 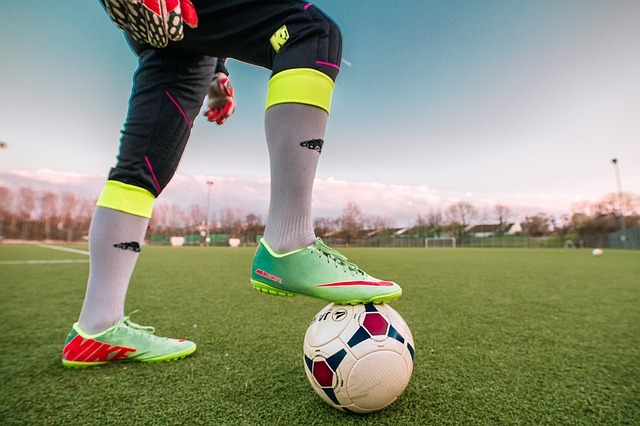 You can try many other high-quality cleats that other soccer players are wearing. When it comes to baseball cleats, then my personal choice is New Balance. I’ve shared many times in other articles also that New Balance cleats are awesome, durable, and very comfortable. However, sometimes, you just want a change. If you want any other pair of cleats that are good as New Balance, then Under Armour Leadoff Low RM Baseball Shoe is a great option. But, before purchasing any pair, make sure to look at these baseball cleats that other players buy. The baseball and soccer cleats are very much similar to each other but do not use baseball cleats for soccer. While you can use soccer cleats in the baseball game. If you are just playing for fun or just checking which sport is good for you, then it can be a good idea to wear this cleat. In that case, buy soccer cleats. But, if you are playing professionally or hoping to play professionally in the future, then stick with one type of cleats.